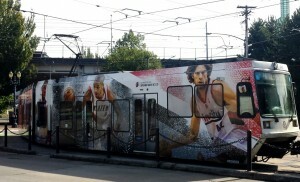 Jump on board Rip City; it’s time to rally our Portland Trail Blazers! Time to cheer on the home team! So jump on board Rip City, and ride to the Moda Center to help the Portland Trail Blazers rally against the Memphis Grizzlies. While the Grizzlies may have won the first two games of the playoff series, now they have to play in our house. TriMet takes you to the playoff action this Saturday and Monday. All four MAX lines, as well as six bus lines, serve the area and provide a convenient way to get to and from the game. If you don’t play by the rules on the court, you get a technical. If you don’t play by the rules on MAX and don’t pay your fare, expect a $175 citation or exclusion from the system. The TriMet Tickets mobile app makes buying and using your fares easier than ever. Just go to the iTunes or Google Play app store and download the free app, register your debit/credit card in our secure system and you’re ready to go. Learn more at trimet.org/mobiletickets.